Brian Woolf's book changed the way companies do business. His Theory: 'Mass marketing is dead'. Differentiated marketing-giving different offers to different customers is the new marketing wave. A graduate of Harvard business School and former CFO of Food Lion, Woolf shows how businesses have to practice the ""intelligent loss of business" for greater profits by reorganizing your business along customer rather than product lines. 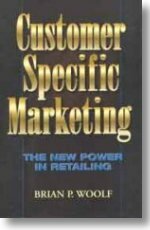 Customer Specific Marketing (CSM) has taken the place of Mass Marketing. This groundbreaking book explains, in a simple, clear style, why and how this radical change has occurred. Today, retailers around the world are shedding their old one-price-fits-all marketing strategies and are offering specific prices and benefits to different customers, achieving significant profit gains in the process. Accepting these principles leads to de-averaging your customers, marketing to each segment individually, and focusing rewards on the desired behavior - frequent, high-spending customer activity. The basic case in favor of CSM. The superior economics of CSM. The ten major characteristics of CSM and how they are practiced. The exciting new measurement now available to help your business. Speeches from seven leading practitioners of CSM validating the ideas permeating the book. This book, applicable to every retail and service company, is essential reading for those who want to be in business - and succeed - in the twenty-first century. Brian Woolf is a global leader in loyalty marketing. In addition to writing three definitive works on the subject, Measured Marketing: A Tool to Shape Food Store Strategy, Customer Specific Marketing, and Loyalty Marketing: The Second Act, he spends his time helping retailers develop and strengthen their loyalty programs. The techniques and metrics he has developed have become guiding principles for those operating some of the world's most successful programs. He is the President of the Retail Strategy Center, and is a frequent speaker at conferences in the US, Europe and Japan. Prior to his total commitment to loyalty marketing, his corporate roles included Deputy Managing Director of Progressive Enterprises, a major New Zealand retailer; Chief Financial Officer of Food Lion, a leading US food retailer; and President of One Price Clothing, a women's discount apparel chain. He has an M.Com. (Economics) from Auckland University, New Zealand, and an MBA from the Harvard Business School.